A large covering has been removed from the front of one of Inverness' most historic buildings. 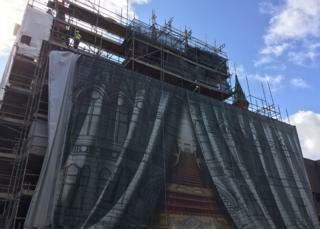 The wrapping showing an image of the inside of the town house was put up two years ago to cover unsightly scaffolding. The exterior stonework is being repaired and refurbished. The covering has been taken down so stonemasons can better see the stone in the final stages of their work. The scaffolding is still in place. Highland Council expects it to be a few more weeks before the scaffolding can be removed. Two stone sculptures of wolves are to be added to the refurbished town house. They will replace two missing large stone dogs that were once a feature of the building. The original designs for the dogs are also long lost. Masonry sculptors and conservators Derek Cunningham and Ivan Navarro created the wolves after doing research into the times when the animals were once native in the Highlands. Built to a Flemish-Baronial style, the town house was opened in 1882 by Queen Victoria's second son Alfred. The building is owned by the Inverness Common Good Fund and is a working local authority building. The town house hosted the only gathering of Liberal Prime Minister David Lloyd George's UK government cabinet outside London. He was on holiday in Gairloch, Wester Ross, and brought his ministers together in Inverness in September 1921. The meeting was called following Ireland's rejection of the King.